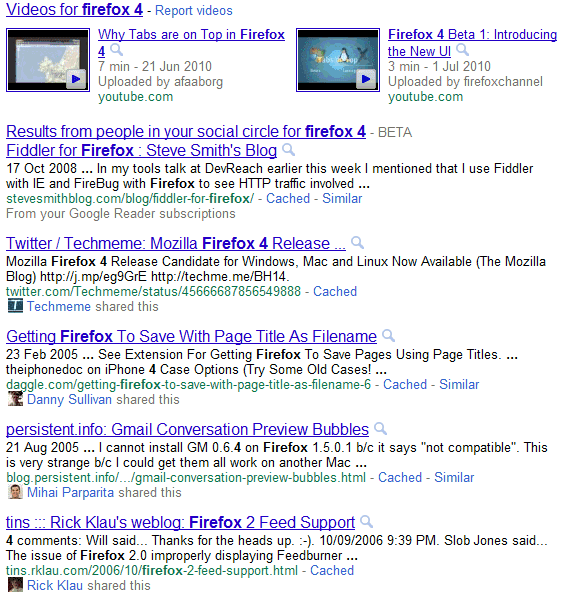 When Social Search was released, Google displayed a small OneBox at the bottom of the first search results page that included relevant pages shared by your friends. A few weeks ago, Google started to show social search results anywhere on the page. If that wasn't enough, Google added huge lists of social search results at the bottom of the second, third and fourth page of results. After the ten regular results, Google shows other ten results from your social circle. Sometimes Google's social results are useful, but that's not always the case. For example, a search for [Firefox 4] returns many outdated pages about Firefox. I don't want social search - Can we turn this off?